Magnifique nouveau condo Penthouse avec terrasse spacieuse face à l'océan! Regarder le soleil se lever sur l'Atlantique à partir de votre belle nouvelle condo Penthouse et votre Deck Oceanfront spacieuse! Unité belle et lumineuse Une chambre avec salle de bain carrelée, chambre de maître avec Built-Ins, cuisine en granit, planchers de bois franc partout, laveuse / sécheuse, Accès par ascenseur et bien plus encore! Pourquoi le Top Floor? Parce qu'il est le meilleur!Obtenez votre morceau de bord de l'océan sur Hampton Beach, une des plages les plus propres sur la côte Est et les Etats-Unis !!! Promenade dans la douche carrelée avec laveuse et sécheuse dans l'unité. Unit was fairly clean when we arrived, location as mentioned is great. A few items, wash cloths, etc. were missing but no big deal. Being avid NFL fans, one of the first things we did was turn on the TV to find the correct stations. Surprise!, No TV or Internet. Shot a text to the owner who called back, then was put on a conference call with the cable company for two hours! Not a way to start a short stay when you have to waste that much time. Finally, the day before we were scheduled to leave, the owner, Sashi, called and said that she had lost their cleaner and could we clean before we left. I said we would, and the morning of our departure we did just that. Because their dryer is so slow, we could only wash and dry the bed sheets and pillow cases, and not the towels. Not wanting to leave wet towels in the washing machine we piled them on it. Dished were put in the dishwasher and run, and the rest of the unit was left in great condition. When we arrived back home, Sashi sent us a message complaining that the towels weren't washed and that the clean dishes were left in the dish washer. I'm sorry but we paid a lot of money to stay there and we wen't hired to be maids. . Thanks for the feedback, I believe I sent you the pictures of the filth and damage you left behind when you check out of our place, that should not be the basis of this review. Please be genuine about your review. First time in 30 years we go to Hampton Beach so late in the season! Most of the stores were closed but we were there to rest! The condo is perfect. the view is amazing. We would go again for sure. Excellent location, super view of the ocean, owner was able to solve problem quickly. The appartment was great. The location is perfect, right in front of the beach, 4th floor, secure, and close to everything. On our first day, Internet and TV weren't working, but Shashi solves the problem quickly, it was appreciated. All the other amneties work pretty well, A/C also works well. Every room in the appartment was clean and matches the description, except for the bedroom. It was really dirty under the bed (we didn't let our baby play on the floor in that room), and the bed was very, very noisy. On the second day, I decided to thighten the base, it was less noisy, but clearly, the bedroom doesn't fit for the rest of the appartment. We would recommand that appartment, but we think the bedroom should receive a little update. Thanks to the owner, we had a really great stay overall. My husband and I stayed here for a week and really enjoyed it. Very spacious, great location and beautiful view of the ocean. Good security in the building and private parking was a plus. Perfect view on the balcony to watch the fireworks. We would go back for another stay. 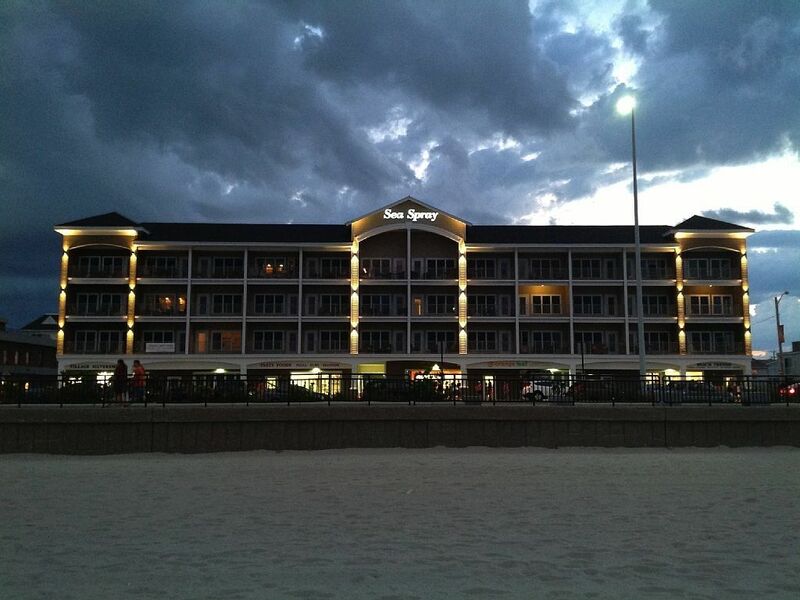 Another wonderful week at Hampton Beach! This is our 2nd year at the Sea Spray Condo's and it is a wonderful place to stay! The unit is nicely furnished and the view of the ocean each morning is amazing. Can't ask for a better location! Shashi, the owner, was very helpful when we ran into issues the first day with the internet and got everything resolved very quickly. Would definitely recommend this unit! If you need additional information, please contact us. We love this property, the views and various activities Hampton has to offer.